This weekend Mandi and I hosted a BBQ (Mandi did most of the actual hosting). In attendance were Kennedy and Karen of the Starbase 66 podcast. We’ve met Kennedy a few times but this was a first close encounter of the Karen kind. We also got to meet her mysterious “Dearly Beloved”, who was much nerdier than we expected. We still have yet to meet Kennedy’s wife “Elizabeth” who, despite baking us a spectacular peach pie, we’re beginning to suspect may not exist. Ironic since she was the one who was famously responsible for the term “imaginary friends” to describe our online family. So far Mandi and I have bowled a perfect game meeting people we got to know on online forums and through their podcasts, but I can certainly see Elizabeth’s point of view. There are certainly moments, such as when I’m truly happy hanging out with online friends at an offline BBQ, where I wonder if too much of our lives are spent in the web-o-sphere. This article deftly explains why we’re unhappy as an online society. It has some interesting points but I still enjoy the buffer and screening process provided by the internet when selecting worthy associates. Now we just need to perfect transporter technology so being spread across the globe isn’t a hindrance to future BBQs. WoW! People get really obsessed with video games. Sometimes they even die for their obsession. Some people rock out with toy guitars, some people make coloured blocks fit together, and some make racial stereotypes hop over turtles. The thing all these people have in common is they’re NERDS. Jakob and Mandi play with the topic of video games and mow the grass of a little drugs podcast called Hooked. Jakob once made a video game called Hoody Fighter when he was mad at his prof . You can experience it in all its splendor HERE. 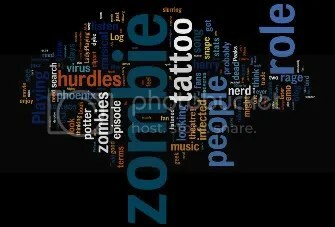 I made a wordle at wordle.net of this blog. It was highly influenced by our search terms post I think. Because we’re really not that big on zombies. As far as musical theatre goes, it’s not the fact I rarely enjoy when a perfectly good play or film is ruined by people inexplicably bursting into song that is the hurdle. It’s the geeky devotion musical theatre inspires in its fans. Rent fans especially seem to feel the need to launch into song whenever the mood hits them. I’m afraid this creates somekind of instinctive cringe reaction in me. That and jazz hands. I can’t get behind jazz hands. Musical comedy, specifically comedic song, also doesn’t really bother me in and of itself. Though the songs are often too long, the joke getting tired after one chorus, hearing a parody or satirical song once can be amusing. They key is once. But sometime people listen to these things AS IF IT’S A LEGITIMATE FORM OF MUSIC. I’ve known people over the age of ten who listened to Spinal Tap because they thought it was simply good music. This doesn’t give me a geek shiver so much sends a geek seismic wave through my soul. And you know right now there’s people playing Flight of the Conchords, The Lonely Island and the Mighty Boosh in their cars and on their iPods. I feel irritated just thinking about it. But there’s an infinite rainbow of hurdles music can inspire in people. We barely scratched the surface of genre hurdles in this episode (there was no mention of prog, jazz-fusion, or ska), we might have to revisit this topic in the future. I know I could spend an hour just discussing Frank Zappa fans. We haven’t posted an episode for a while because we went on a little holiday which we forgot to properly annouce we’d be going on. You can read about that at Mr. Dapper. The goal is to end the hiatus tonight (August 14th, say 8pm EST?) with an episode on music hurdles. We’ll see if that happens. 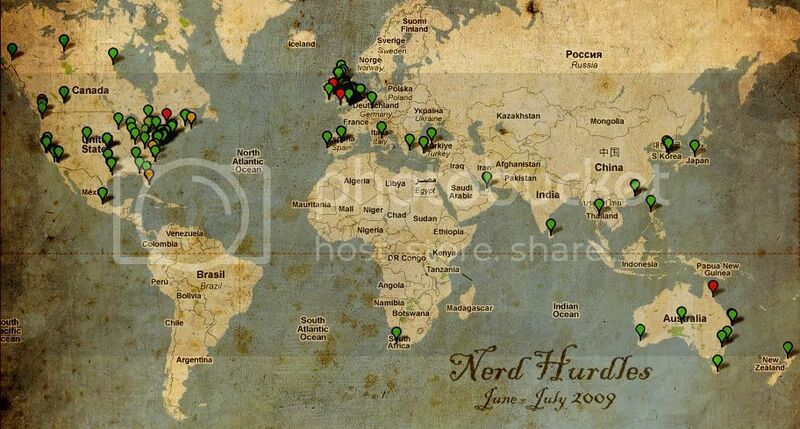 Until then you can take a look below at our June-July 2009 listener map. Perhaps you can find yourself. We’re excited to have so many new listeners from exotic (to us, probably not to you) locales dropping in. Click gently to make larger. WordPress is statstastic. My favourite stats are the stats on search-engine terms people use to get to this blog. Or perhaps more accurately the search terms that get them hijacked and sent to this blog when they’re looking for something else. 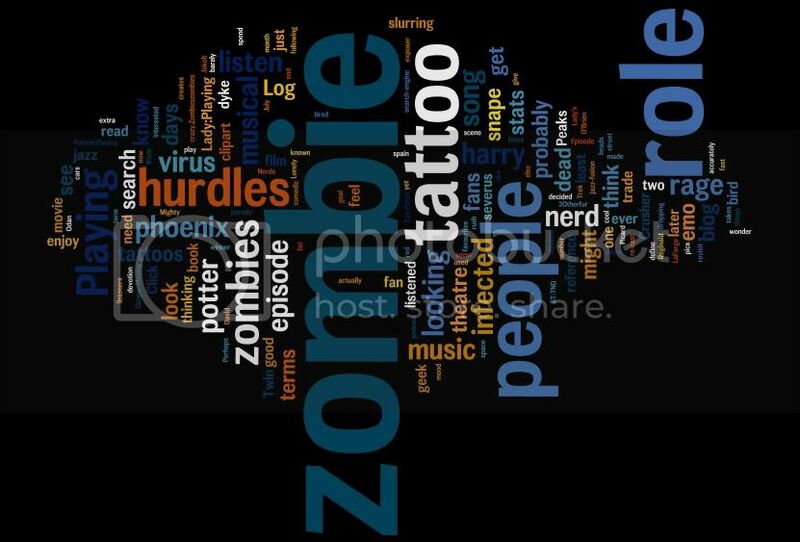 I wonder if any of the people looking for “zombie dyke” or “slurring severus or snape” actually read these entries. And do they then ever click on the podcast link. Well stats on the click-through says no to that latter question. Here are the search terms and number of times they were used for the month of July (I’ve put my favourites in red) and what I think we can see here are people are generally zombie crazy. “poisoned tooth” scene in the film – 1 (Ironically, I don’t think we’ve ever made even the vaguest reference to Duneon this blog yet this is probably the most accurate search term on the list. At least the searcher would probably be the least disappointed). You are currently browsing the NERD HURDLES PODCAST blog archives for August, 2009.